Arvind Radhakrishnan (Editor-in-Chief of The Bangalore Review (TBR)) and Suhail Rasheed (Managing Editor,TBR) interviewed the legendary bookseller and owner of the Premier Book Shop, T. S. Shanbhag at his beautiful home in Bangalore. Arvind: Sir, I would request you to start by telling us about your experiences, right from how you got started in this particular area of bookselling. Mr. Shanbhag: So, basically, I started with my uncle in Bombay. You must have heard, you know, Strand Book Stall in Manipal [Centre]. That is, his daughter was running it. So, after I came – I come from a rural area – after my matriculation, he also wanted somebody – a known person – I started working with him. That is where I got my experience, in Bombay. I completed my post graduation degree in Economics from Bombay University. I was there for 10 years. Then, he wanted to branch out, in the sense, he started this thing called Book Club, Strand Book Club, with one of the publishers. You know, they for the first time started giving any book at 20% discount. For that, he wanted more branches to be open. And they thought of Bangalore as one of the prospective branches. Arvind: What was it called? Mr. Shanbhag: Strand Book Club. The original shop was called Strand Book Stall. And this Strand Book Club was a part of it. Arvind: Did it have any meetings as a book club? Mr. Shanbhag: It was not for meetings. It was more of a discount-selling kind of scheme. Anybody can enroll as a member and then, they send you brochures and list of new books. And the books we keep are given at a 20% discount. That was as a promotional offer kind of thing, and not as a meeting for discussion or anything. It was done more from a selling point. After three years of running that, the partners had a little difference, so he had to close down. And he said, “If you think you can start another shop here, just look around.” That was in 1971. In 1968, we started [the Strand Book Club], where now there is… next to TVS Mohan Mansion, there is a Karnataka Bank, that’s where we were for three years. After closing down, I just looked around for 8-9 months, without any job or employment. Finally, I found this place, which was vacant and took that. Since then, I have been there till 2009. I had to vacate it. Suhail: Unfortunately, that was the year I came to Bangalore. Mr. Shanbhag: (laughs) So, you didn’t come to my shop. Suhail: I kept hearing about this shop and went around Church Street asking for this shop. Finally, one of the shopkeepers told me its been closed. Mr. Shanbhag: People still, on and off, show my shop as one of the places to visit in Bangalore. Suhail: So what happened after that? Mr. Shanbhag: After that, it was more of a retirement. I was also getting older. I never thought of going to look for another place. It was getting even worse and worse. Now if you see how the… When did you start from your place now? Suhail & Arvind: We met in Frazer Town at around 4. Mr. Shanbhag: Hmmm… Being Sunday, the traffic might be less. On any weekday, it used to take me half an hour from here [to the shop]. Later on, sometimes, from 9 o’clock it would take me minimum one hour to reach the shop. Earlier, parking was not a problem. Later on, it became so difficult. Luckily, beside the stadium there was a road, I would park there and come walking to the shop. Arvind: So, you used to commute everyday from here. I always had the feeling, when I was a student, that you stayed somewhere around the area (Church Street). Mr. Shanbhag: No. First I was in Gandhinagar, for about 14-15 years. That is, from 1968 to 1984. Then, I constructed my house [in Basaveshwar Nagar] and that’s how I moved here in 1984. Since then, I have been here. Ever since the Metro [construction] and all started, it slowly got worse. Sometimes, I start at 8 o’clock [from the shop] and I’ll reach here at 10 o’clock. My wife will be keeping on waiting thinking what is happening and she will phone somebody, “Oh, my husband has not come”. So, it was getting so bad. Arvind: What do you think about the condition and prospects of the bookselling industry right now? 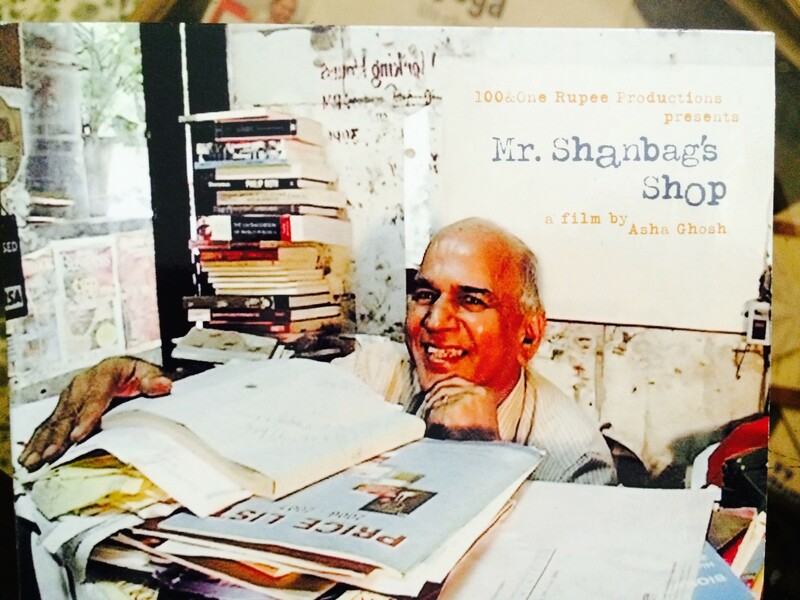 Mr. Shanbhag: It is good, except now what I have found is more of an e-commerce approach. You know, online selling. So they see things on portals like Flipkart, they offer a higher discount than what you get on retail. Suppose, people like me want some books, I also bought a few books for my granddaughter from Flipkart. Just order and they send you the books. And on delivery, you pay the cash. Of course, people still visit bookshops even if it is just to look around. That’s the report what I am getting. Strand also closed in Manipal [Centre]. And what is that, next to Lakeview [Milk Bar]… (Arvind: Pageturners )..also closed down. And few of the publishers also… Even I heard this Reliance [Timeout] on Cunningham Road also closed. Suhail: They [Reliance] have turned into a digital goods store. Mr. Shanbhag: Exactly. I find that retail is getting lesser and lesser. Of course, there are places like Blossoms ……because he sells both used and new books. That’s how they maintain their kind of business. New book sales, I think, is more affected. There are readers. Other ways of getting books has made it difficult. Cost of maintenance, and overhead costs are going high. And if you are not getting enough sales, it is very difficult. Near my place, they have turned it into a bar now (an ironic smile from Mr. Shanbhag). The profit margin is more for such ventures. Suhail: Actually, that building is leased to someone I know. Mr. Shanbhag (laughs): I saw that man the other day. He said someday he would offer me a place. He was with this lady who did a documentary on me, I don’t know if you know this. Her name is Asha. Arvind: What was the documentary called? Arvind: What about the readers? Can you tell us about the changes you have noticed among the readers, over the last four decades? Mr. Shanbhag: Readers are always there. That hasn’t come down or anything. But the type of books that are being published… You see so many books are being published. Readership has not come down. Because of the growing kind of population, even if the percentage of people who read are less, the number of readers may actually be more or same. Arvind: But the quality of readers…. Mr. Shanbhag: (laughs) Maybe, it is possible that it has come down. More and more now, with all sorts of things coming in, I think it is… and also, with e-reader and kindle and all those things, it is different. Readers are there, but they are into a different kind of thing. They are more into popular fiction and things of that sort. Mr. Shanbhag: How do you find your magazine doing? Arvind: We just started it out of certain shared interests in literature and philosophy. We are getting good readership, but surprisingly a lot of contributors are from abroad. We wanted to focus more on literary criticism and that was the idea with which we – there are actually three of us – started. Mr. Shanbhag: What about Prof. Cheriyan Alexander (He is a member of the Editorial Board of the Bangalore Review (TBR)? 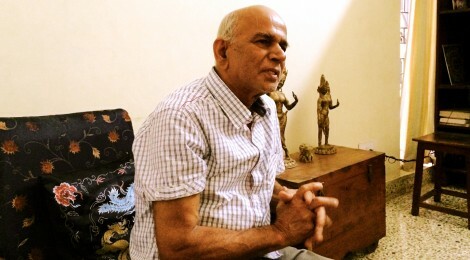 Arvind: He was my teacher (at St.Josephs College,Bangalore). And he is helping us out in an advisory role. He has also written some articles for us. Anyway, the idea was to include quality literary criticism as it seems to be vanishing, at least in India! But we found that we are getting a lot more stories and poems, and that too from US, Canada, UK, etc. Suhail: We are operating as a non-profit and that’s why we are only online right now. But someday, when the funds allow us, we are planning to take the magazine to print. That’s the vision. Arvind: We have had writers like Meena Alexander, the poetess, write for us. Tabish Khair has also written in our magazine. Arvind: In terms of the reader again, you had mentioned earlier that people like Girish Karnad and others used to visit your shop. We happened to meet Girish Karnad recently at an event in British Council. We asked him whether he knows any people who write about theatre. And he said, I don’t know of anybody who writes about theatre anymore. What is your experience? Is theatre still followed by people? Mr. Shanbhag: There are people who still love theatre. But again, the number of people is less. And sometimes, you know, the proximity of the venue and that kind of thing is a hindrance to this. Arvind: But again, who are the people reading plays? Or for that matter, even good fiction? The younger generation seldom read Tolstoy, Dostoevsky, Thomas Mann or Marcel Proust. I remember that you had a weakness for Albert Camus. Mr. Shanbhag: Ah..Camus (a pleasant smile).I have a fondness for his works. Yes,that is for serious reading. At that time, a lot of people, even youngsters were coming in asking for serious reading material. It is not always the bestselling kind of thing. Arvind: I teach that [youngsters’] age group, 19 to 24 at the law school. Slowly, you can make out that they are more into popular fiction like the Twilight series, and those kind of books. Mr. Shanbhag: Actually, my granddaughter is a great reader. She is in Australia. She always watches the Twilight series and ghost stories. After Harry Potter came out, these sort of series have become a craze. So many books are coming out along similar lines. And it is all very popular. But, of course, Enid Blyton also still sells. In spite of that, these [the modern popular fiction] are the more bestselling titles. Harry Potter, of course, had a good something. But all the others… I don’t know how good it can be. Arvind: What do you foresee? Will this generation ever get into that kind of serious reading? I know there will be a few people, but what about the majority? Mr. Shanbhag: They also come into this. Thing is nowadays they have a varied interest, not just – you know – one kind of books. They also read other kind of books. Sometimes, they also go through a transition period, you never know. Arvind: We find that a lot of magazines along the same lines as ours are in existence in different parts of India. But, we see that the focus is more on poetry and fiction, in order to encourage young writers. We don’t see literary criticism like the kinds of Paris Review, New York Review of Books, London Review of Books etc. Mr. Shanbhag: (ruminates for a while) Literary criticism will be difficult. I know. Unless you are into detailed study, normal people won’t come into doing that. Sadly, most people refrain from it. Serious readers might enjoy reading literary criticism, but a very few people. Anyway, you have started a good work. Arvind: It is a nostalgic moment to come here today actually. You probably don’t remember me. Mr. Shanbhag: I’m sure you have grown a little bit from that time. Arvind: Yes. I used to come there. My father used to give me pocket money and I spent most of it buying books from you! You remember those Penguin classics, the light coloured books. Mr. Shanbhag: Yes, yes, I remember. At the same time they used to have special prices for those books. Now they have become at least two-three times costlier. They started with Rs. 60. Arvind: And now it is Rs. 200-250. Mr. Shanbhag: They also used to have abridged edition of those. Real thin ones. Suhail: Yes, children used to get started with those. Arvind: Yes. So, I used to come and buy the unabridged versions. One every week actually. And I still remember the stack in the middle. It never fell and I always wondered how. Mr. Shanbhag: It won’t fall because it was all stacked in a slanting position. It would have fallen if it was straight. Suhail: Now, you have been in Australia all this time? Mr. Shanbhag: No, we went twice. And then for some time, my daughter came here. She must have come some 2-3 times. So, now we go one year and they come here the next year. Arvind: Do you visit for long? Mr. Shanbhag: When we go, we stay there for two-three months. Suhail: How do you find the bookselling scene over there? Mr. Shanbhag: They have the same problems. There are many stores which closed down. Most of the mall shops are getting closed. Mainly, as I said, people are reading, but they don’t like to visit the shops. They buy everything online. Some models still survive, probably due to lower overheads or some other business model. Big, big ones in US also have closed down. Barnes & Nobles is an example. Borders also were in Australia. They are also closed down now. Arvind: What is your view of Kindle? Many of my friends read from Kindle. But I can’t read unless I get the feel of the book in my hand. Mr. Shanbhag: Technically I am not too good. I too prefer to have a hard copy of the book. I have an iPad. But I never use it. Somehow, I never got used to reading on screen. I would rather read from a book or a magazine, than from a screen. Even in the case of credit card, it took me so many years to start using it in the shop. Even if it came to losing business, I never kept a credit card machine. Eventually, I had to because Guha said. You know Guha right? Arvind: Of course. We don’t know him personally though. Mr. Shanbhag: He is very close to me. He hosted a party when we [Premier Book Store] crossed thirty years, and called all the regular people like Karnads, Chiranjeev Singh, etc. A lot of people were there that day. Arvind: Are you still in touch with Mr. Guha ? Mr. Shanbhag: Actually, I have not been. I want to meet him. On and off, for one or two [book] releases, he sent me email invites. But I didn’t go. It was bad of me to not have gone and spoken to him. Arvind: Any special memories of writers visiting your shop? Or even celebrities? 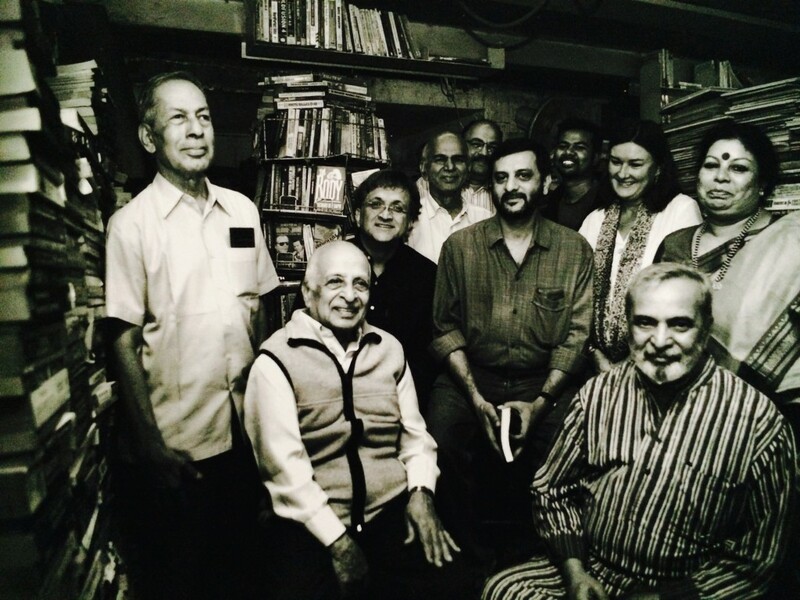 Mr. Shanbhag: UR Ananthamurthy and other leading Kannada writers used to visit. Mr. Shanbhag goes off to fetch some photographs. Mr. Shanbhag (back in the room, shows us the photo): This was taken on the final day, when I closed the shop. Mr. Shanbhag then shows us several photographs from different eras, but mostly from the party Guha hosted on the 30 years anniversary of Premier. There are also photos by late Raghav Shreyas and a signed copy of Guha’s book (‘India after Gandhi’). Suhail: So, who took these black & white photographs? Mr. Shanbhag: A young chap called Raghav Shreyas. He was supposed to get married around that time. But suddenly one day, he collapsed in Koshy’s. He had brain tumour. He underwent treatment, but didn’t survive. Suhail: I have seen some of his photographs on a website. There is a foundation called Raghav Shreyas foundation. As we sift through the photos, we discover many known & renowned faces. Suhail: So, how do you spend your time nowadays? Mr. Shanbhag: Reading some, going through newspapers, taking a walk, relaxing. It is a good retired life. Arvind: Who were the other people who would walk in just like that into your shop? I remember Mahesh Bhat was a visitor. Read about it somewhere. Mr. Shanbhag: Yes, Mahesh Bhat was one. He was asked to do a documentary for BBC on places for people to visit. They covered that dosa place in Basavanagudi as well. (Vidyarthi Bhavan). Yes, that one and my shop were featured. And whenever he came to Bangalore, he used to visit my shop. Pooja Bhat, his daughter, also visited. Tamil actor, Kamal Haasan also has visited. He used to come. He is an avid reader. Of course, later on, he stopped coming. Initially he used to. Arvind: And you had a conversation with him? Mr. Shanbhag: Yes, sometimes. People who wanted to read used to come to my shop because unlike other shops, here you get a background and an idea of what to read. Arvind: Yes. I totally agree. You are the one who introduced me to the Babbitt Series (Sinclair Lewis). I remember at that time I was into American literature. You wouldn’t impose any book on the customer. But you had a way of suggesting the book, saying “try this”. Mr. Shanbhag: (smiles fondly) What happens is… its like this. You get to know the people’s psychology, what they read. Let us take Guha, for example. That is how I was impressed. When I know he reads this kind of books, next time he comes I will point out saying this is what you want. Otherwise, nobody will point out, you know. We get to improve our sales and at the same time they get to know new books. Arvind: You knew him from the time he was a student? Mr. Shanbhag: Yes, almost. I think. Arvind: Was he an avid reader, even back then? Mr. Shanbhag: Yes, yes. We had another good customer who was the regional manager of State Bank of India. He used to write in newspapers also, on cricket and other things. Suhail: In our first issue of The Bangalore Review (TBR), we had written something on Bookselling and its future. We discussed something about bookstore tourism. It is picking up in US, Europe and all. Mr. Shanbhag: Lonely Planet India also writes on the bookstores in the city. My bookshop was also mentioned there. Suhail: In our article also, we had mentioned your name and also about, Strand, Blossom. In Singapore also, there is a bookshop called Books Actually, which again we mentioned in our earlier article. They follow this same method of curating the books for the customers. Mr. Shanbhag: Yes, that’s the training I got from my uncle. He was very popular. He also got Padma Bhushan. Uncle in the sense, his father and my grandfather were brothers. Suhail: Lot of people give us fiction and poetry. Mainly, we find a void in literary criticism. Arvind: Literary criticism is a dying art. Many people can write poetry and stories. To read a book and to write about it, few people are able to do it. Suhail: Our team had this discussion last week. We now realize that if literary criticism cannot be saved, even good writing cannot be saved. Mr. Shanbhag: Yes, that is right. Good writing cannot come unless you have good critics. Something needs to be there. Arvind: Thank you so much for your time.